Did you have a glass of water today? Did it quench your thirst? Was it refreshing? Did it have lead in it? Answers to the first three questions should be easy, but an absolutely confident response to the last one may be harder than expected. 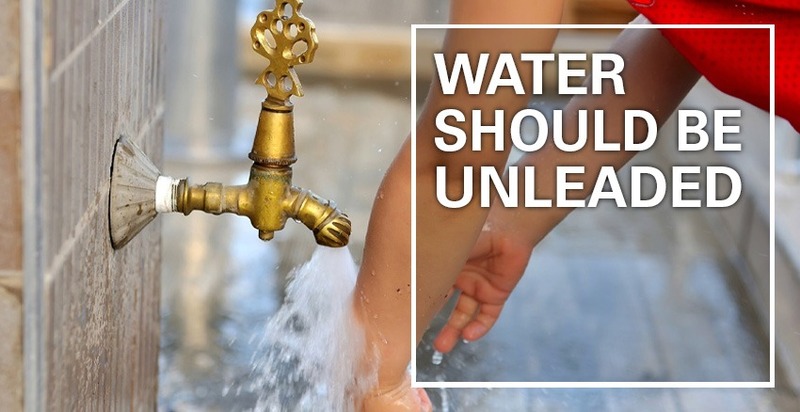 That’s because, unless you’ve recently replaced your home’s pipes or had your water tested by a professional, you cannot say for certain that the glass of water you enjoyed earlier didn’t have a little something extra in it, like lead. Is there lead in your home? Lead has made its way into our homes through many common products like paints, stained glass, lead crystal glassware, ammunition, ceramic glazes, jewelry, toys and in some cosmetics and traditional medicines – to name a few. Most people think of lead-based paint as the primary source of concern. But, in some homes, especially those built prior to 1986, lead continues to make its way in through solder, old fixtures and some much older lead pipes. Lead rarely occurs naturally in drinking water, and yet our drinking water supply seems to be the real main cause of concern for lead in our homes and commercial structures today. This means plumbing is usually the culprit. Unfortunately, those older architectural beauties are more likely to have problems. Prior to the late 80s, lead piping was still acceptable and lead solder joining pipes was widely used in plumbing systems as well as in the service lines connecting them to the street water mains. And, don’t think newer homes and buildings are not at risk. Some legally “lead-free” plumbing may still contain up to 8 percent lead. You may also find lead seeping in from those pretty brass faucets and valves made as recently as 2014. Lead continues to be a major problem. Some water contaminants, like chlorine and iron, can be easily detected by smell or taste. But not lead. It is a cumulative poison that builds up in the body over many years – without notice – until it reaches toxic levels. Know the signs of lead exposure. Symptoms of lead exposure may occur slowly – causing them to be overlooked. They are sometimes misdiagnosed as the result of other things. Lead also affects people differently depending on their age and development. Children and pregnant women are most at risk. And, children tend to show signs of severe lead toxicity at lower levels than adults. Infants: Delays in physical and mental abilities. Children: Brain and nervous system damage, behavioral and learning problems, lower IQ, issues with hearing, slowed growth and anemia. Adults: Nervous system impairment, high blood pressure, hypertension, kidney problems, and reproductive issues. Government regulations are taking affect. In 1986, the U.S. Environmental Protection Agency (EPA) banned the use of lead pipes and lead solder in plumbing systems. In 1996, Congress further amended the Safe Drinking Water Act of 1986, requiring plumbing fittings and fixtures (endpoint devices) to be compliant with voluntary lead leaching standards. The amendments also prohibited the introduction into commerce of any pipe, pipe or plumbing fitting or fixture that is not lead free. In 2011, Congress passed the Reduction of Lead in Drinking Water Act (RLDWA) revising the definition of lead-free by lowering the maximum lead content of the wetted surfaces of plumbing products (such as pipes, pipe fittings, plumbing fittings and fixtures) from 8 percent to a weighted average of 0.25 percent. The U.S. government continues to work on improving policies that help prevent and protect against lead exposure. Unfortunately, there is much historic construction that still needs updated or replaced. And, there continues to be a breakdown in communications and testing at the state, regional, and city levels to this day. We can all help too. Use only cold water for drinking, cooking and making baby formula. Hot water can increase the level of lead absorbed from pipes. Regularly clean your faucet’s aerator screen. If water has been sitting in your pipes for more than six hours, turn on your tap and flush with cold water (not hot) for at least 1 or 2 minutes to remove any accumulation. You can easily check what kind of solder was used on pipes because the lead solder is dull gray in appearance and only looks shiny underneath when scratched. If you’re not comfortable checking, call your plumber. Consider using a water filter certified to remove lead and replace the filter as needed. Be aware that each water filter guards against specific contaminants and may not solve all your specific needs. Call a water system professional regardless of your building’s age. Gordon Brothers Water can help and has helped. In 2016, Gordon Brothers Water helped the Howland Local School District in Trumbull County, Ohio resolve unacceptable levels of lead found in its water supply because of an older plumbing structure. This included drinking fountains in the district’s six buildings used by more than 2,500 students and 330 staff members. When initial cost estimates to replace all of the plumbing reached $250,000 per building, the superintendent needed to find an affordable and more effective solution. A local engineer, CJL Engineering, installed a PEX tubing system through each of the six buildings – bypassing the old plumbing that caused the lead contamination. Gordon Brothers Water then installed advanced filtration systems needed for each location. This included specific filter technology for drinking water fountains and a separate reverse osmosis system for kitchens that used more water. These systems would continue to remove any remaining impurities found in the school drinking water. Not only did these solutions together solve the lead contamination issue, but the district slashed the original $250,000 price tags down to just about $18,000. Commercial or residential, Gordon Brothers Water can help. Take the first step by scheduling a free water analysis – call 800-331-7611 today. Gordon works with local testing labs specifically for checking lead contamination in water.